Georgina, Duchess of Devonshire: I feel I’ve done some things in life too late and others too early. It seems that with each passing year, there comes a point in time when we will inevitably find the young and beautiful, Keira Knightly, in yet another period drama. It also seems like every period drama these days, whether it features Knightly or not, feels the need to disassociate itself from the conventions of the past and assert itself as fresh, with a unique twist on the genre. This is particularly challenging when the story is one we’ve seen a number of times prior. The true story of Georgina, Duchess of Devonshire, as told by director, Saul Dibb, in THE DUCHESS, is one where a young girl of “modest” heritage is married off to an esteemed Duke for a price. Her duty is to serve his grace and provide to him a male heir. As a woman, she is nothing more than a decorative commodity and should she not be able to fulfill her wifely promises, then she is essentially useless. Dibb is smart about it though. With the point already made before the film even begins, he chooses to focus instead on the reality of this kind of imprisonment – what it feels like for a girl beneath her binding bodice. Knightly carries the weight of this film on her shoulders while carrying the weight of the wigs on her head with poise and prominence. Her big brown eyes go from playful to shy to distraught and defeated. When we first meet her, she is free and seemingly unaware of the heavier world outside of her backyard games. Before long though, she is face to face with adulthood. 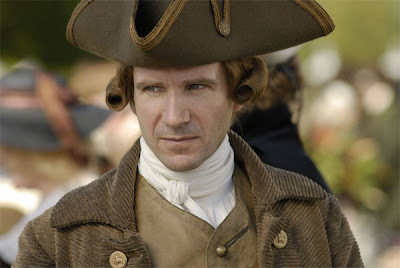 This particular face belongs to Ralph Fiennes as the Duke of Devonshire. It is here that Dibb steps in to add another layer to the played out trajectory. With an age difference that is only matched in vastness by the distance between them, the Duke undresses his Duchess and asks why women’s clothing must be so complicated. There is no better occasion for small talk than before two practical strangers go to bed for the first time. Knightly, trying desperately to hide her nervousness, replies with to the obviously rhetorical question though, claiming that this is the only way for women to express themselves in the times they live in. It is clear she is not sure that a reply is necessary or even allowed but it is also clear that she speaks to ensure that she is seen, that her person is present. Her clothing falls to the floor and the imprints of her corset can still be seen on the smooth of her back. Dibb follows this form of unexpected intimacy and insight with commentary about celebrity and how little the adoring public truly knows about their icons. The Duchess of Devonshire, or at least the one in THE DUCHESS, was an immense influence on her people. Her presence at events guaranteed crowds while her fashion determined the trends. Even her association with particular people could sway public and political opinion. She embodied grace and extravagance while remaining humble and the public ate it up. In their eyes, her life was perfect but those who traveled in closer circles knew better. They knew that there was little love between the Duke and Duchess and increased strain as she was not able to provide a male heir. Even they didn’t know just how bad it was though. The wait staff on the other hand could have made millions on a tell-all. Like Stephen Frears’ THE QUEEN, Dibb shows us what goes on on both sides of the castle gates, highlighting the drastic disconnect between the two close worlds. The Duchess was made to make many horrific choices and concessions that would have broken many a lesser person. What makes them so harrowing in the context of the film is the plainness with which they are expected by the Duke and subsequently accepted by all involved. THE DUCHESS is shocking on many levels. It is shocking how harsh it is underneath its polished finish and how new this old tale feels. It is shocking how well Knightly can hold her pain and her own. And it is shocking how little value and worth was once afforded the women of the world. But it is perhaps most shocking that the manner in which women were once seen as a male possession, with purpose and function that only serves the male agenda, still exists today, no matter how you dress it up.